The idea in a nutshell : Any comparison of Prepaid Plans will show you options you might not have considered. There are a large number of small companies which offer a great deal more for consumer’s money than equivalents (often on the same network) from bigger phone companies. Smaller phone companies are set to win big in the next 2 to 3 years. Here’s why it might be time to invest in one. Telcos have made little progress in adapting their business to the changing needs of customers. They also suffer increasingly competitive environments. The result of the intersection of these points can be seen in their share prices. Essentially, many telco stock prices have gone nowhere in the last 10 years. USA and other global telcos have fared only slightly better. Recent changes, however, suggest that some telcos (notably smaller ones) are going to do a good deal better in the near future. Australia’s market is a good example which is often forgotten. Phone company network products suffer from commoditization : There are only 3 major Australian phone companies. Each has their own network. 4G data coverage is remarkably consistent across them, covering something between 96% and 98% of the population, whichever network you’re on. There are, however, around 50 phone companies in all, across Australia, competing to acquire new customers. A recent trend shows that people’s preparedness to try one of these smaller, network resellers is increasing. SIM Only agreements : The move to SIM Only agreements (as opposed to the old model, under which people bought a phone in contract from a big phone company and upgraded every 2 years) has been the biggest change in telco in the last 5 years. It’s driven by a number of factors. First, the length of time people have owned their phones has increased. Lackluster device improvements (were you excited to see the new iPhone 8?) and sky rocketing prices (it cost $1000! ) have reduced the incentive to upgrade each year. A flood of cheaper Android devices with great specifications perform 80% of the tasks you’ll get from the latest Samsung. Device manufacturers are strategically focusing on new channels in which to sell their devices. Telco’s decisions as to whether or not to range a phone manufacturer’s device can make or break a quarter for them. They want more control themselves over how their sales go. Finally, at an individual level, consumers show Increasing sophistication around cost management with many buying their device outright and adding a SIM themselves to keep costs down. Once out of contract, these people are free to move anywhere they want. Preparedness to try new brands : A recent study showed that around 30% of people were prepared to try a smaller brand as their phone company. Smaller phone companies often charge less for data and offer better customer service. As a result, it seems likely that we will see a net migration from big phone companies to smaller phone companies in the near future. We are left then with network products from the major phone companies which are essentially the same and relatively expensive when compared to a myriad of alternative plans offered by smaller phone companies. The people doing the comparison are increasingly smart about the costs involves and increasingly outside contracts which constrain their movement. They are also prepared to try new brands if it cuts their costs. How then, do these smaller phone companies create the right sort of incentives to attract new customers ? Innovation around ‘fairness’ : Smaller phone companies are investing not in the expensive content rights that their bigger counterparts favor, but in more fundamental unmet customer needs. They’re focusing their attack on data services, the only thing anyone is interested in any more. Intelligent smaller phone companies are offering ingenious data deals that grab customer attention. One provider offers customers more data on the weekend when they are out and about and away from their wifi. Another provides a ‘data vault’ – banking any data purchase so the consumer can use it in subsequent months if they didn’t use it in the previous month. Another passes on any cost cuts to their customer base without users having to ask it. Compare that to the behavior of the big phone companies! In every market, including Australia, the balance of power is moving away from oligopoly phone companies and towards consumers. This is a typical shift in the move towards the digitization of everything, including telco. The big phone companies simply have too much to lose to offer the sort of innovation on data pricing that the smaller telcos are leveraging. 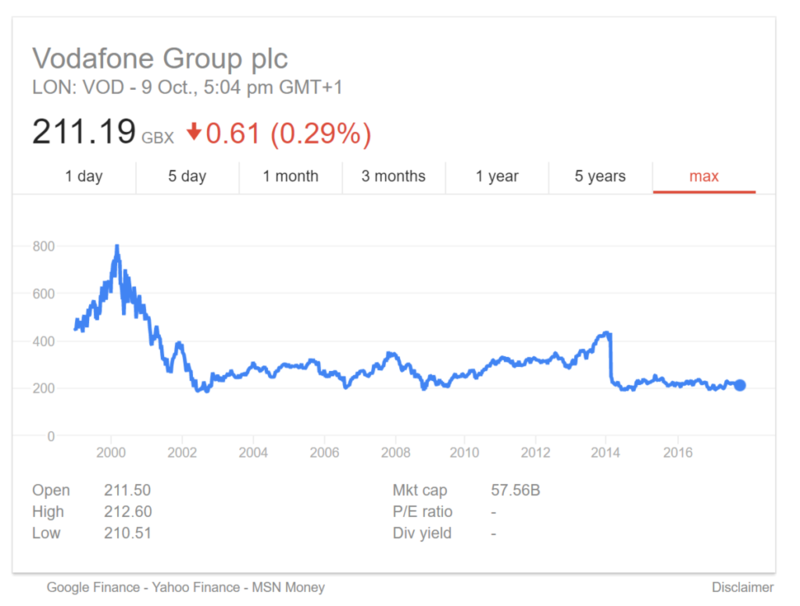 The best investment you can make is in smaller phone companies who are going to benefit from the fallout, growing quickly in the next 2 years, before 5G arrives.